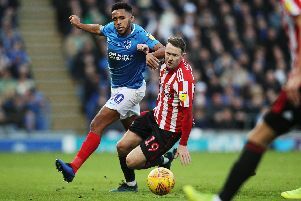 Guy Whittingham believes Pompey’s players have been given a ‘ruthless’ reminder as he looks to shake up his squad. The Blues boss yesterday brought three new faces into training as he mulls over bolstering his side in light of Saturday’s York debacle. Keeper Arran Lee-Barrett and veteran midfielder Gavin Mahon joined Therry Racon as Whittingham looks to freshen up his squad in light of a loss of form and injury to current regulars. The arrival of Lee-Barrett, in particular, is fascinating – with Pompey’s goalkeeping situation still a huge concern 11 matches into the season. The former Hartlepool and Ipswich shot-stopper’s presence is clearly ominous for John Sullivan and Phil Smith, who have both struggled to convince and made costly errors in what has now become a disappointing start to life in League Two for the club. And speaking about the arrival of the three players overall, Whittingham insists changes have to be made to get the Blues’ faltering campaign back on track. He said: ‘We are just having a look, there is no harm in doing that – particularly with Simon Ferry having gone down injured and Shaun Cooper also out at the moment. ‘All three trained with us yesterday and look all right, although Mondays are not the best day to gauge them following a match weekend. We will be able to open it up more on the pitch today. ‘Standards have got to be met. We have set those standards but fell short of them on Saturday against York. ‘We have got to bring in people who more than likely can ensure that does not happen again. We cannot hang around. ‘We cannot keep giving people chances to put things right – we don’t have time for that and something needs to be done. ‘It’s a ruthless world, players have got to realise that. You cannot allow people to rest of their laurels. ‘We’re hoping to have the three of them all week, not one or two days, as we need to have a proper look at them to see where they are at. Sullivan was at fault for two of the goals in the Bootham Crescent humiliation at the weekend, prompting him to come under some fierce criticism from supporters. Ironically, the previous match against Fleetwood, he turned in his best Blues display to date with a string of fine saves in the 1-0 defeat. Now Lee-Barrett is at the club seeking a deal and, if he impresses, is likely to line-up against Rochdale at Fratton Park on Saturday as Whittingham looks to ring the changes he has promised. The 29-year-old was most recently at Millwall in April as emergency cover. Mahon made 215 appearances for Watford during his career, appearing in both the Premier League and an FA Cup semi-final for them. The defensive midfielder was last season with Notts County, although finished the campaign on loan at Stevenage. There, he made nine appearances before his release in the summer. As revealed by The News yesterday, Racon is back in the Pompey frame having been unable to find a club since leaving Millwall at the end of last season.